Native to Taiwan and Japan, this superfood is rich with phytonutrients, including amino acids, chlorophyll, beta-carotene, potassium, phosphorous, biotin, magnesium and the B-complex vitamins. Chlorella is a blue-green algae like its cousin spirulina, and we will compare the nutrients of these superfoods later in the article. Chlorella’s rich green color comes from a high concentration of chlorophyll. We are all told to eat more leafy green vegetables for good health, but sometimes it can be difficult to get the 5-7 servings of vegetables a day recommended by nutritionists and doctors of functional medicine. While juicing is another option, it’s simply too time-consuming for most people. And frankly, most green leafy vegetables pale in comparison to the health benefits that chlorella can provide. As you’re about to see, chlorella is one of the most nutrient-dense superfoods in the world. In addition, chlorella contains a good amount of vitamin B1, vitamin B6 and phosphorus. When you look at its nutrient density score, it’s easy to see why chlorella is ranked one of the top 10 health foods in the world. In fact, it is way more nutrient dense per gram than other greens, including kale, spinach and broccoli! Here are seven scientifically proven chlorella benefits you can expect to receive by incorporating this superfood into your daily diet. If you have mercury fillings in your teeth, have been vaccinated, eat fish regularly, have been exposed to radiation or consume foods from China, you may have heavy metals lurking in your body. It is important for your overall health and wellness to be proactive in detoxing heavy metals and toxins. Radiation therapy and chemotherapy are the most common forms of cancer treatment today. Anyone who has gone through either of these treatments, or knows anyone who has, knows what a toll they take on the body. Chlorella’s high levels of chlorophyll have been shown to protect the body against ultraviolet radiation treatments while removing radioactive particles from the body. Research published in 2012 in the Nutrition Journal found that after 8 weeks of chlorella intake, NK cell activity improved. Researchers from the Yonsei University in Seoul Korea studied healthy individuals and their immune system’s response to chlorella supplements. Chlorella benefits you by helping to regulate hormones, helping with metabolism, improving circulation, and promoting higher levels of energy. It also helps to reduce weight and body fat, and removes stored toxins. As our bodies lose weight, toxins are released, and can be reabsorbed. It is important to flush these toxins out of our system as quickly as possible. Chlorella’s ability to surround the toxins and heavy metals resident in our bodies helps facilitate elimination and prevent reabsorption. The reason chlorella is so effective at giving you younger looking skin is because it naturally increases levels of vitamin A, vitamin C and glutathione in your body which eliminates free-radicals and protects your cells. By just taking 1 teaspoon or a couple capsules daily of a chlorella supplement, you can see results in as little as 2 weeks. First, when taken preemptively, it strengthens the immune system, so our bodies respond properly. Second, because it removes heavy metals and toxins from our body, we are less likely to get environmentally based cancers. Third, studies have shown that individuals once diagnosed with cancer, chlorella enhances the action of T cells helping to fight new abnormal cells. And, as mentioned above, if cancer is diagnosed, and chemotherapy or radiation therapy is used, chlorella can help to fight the side effects and be used in addition to natural cancer treatments. Type 2 diabetes and high cholesterol are two of the serious chronic conditions facing many Americans today. Years of improper eating, stress and a lack of sleep have led many to one or both of these diagnoses. Most people are consuming far too many omega-6 fats compared to omega-3 fats. Both omega-3 and omega-6 fats are PUFAs and they're both essential to your health, but when omega-6 is consumed in excess, it become problematic. However, too many PUFAs contribute to chronic inflammation, which causes all sorts of problems over the long-term. Inflammation is at the source of just about every chronic disease we see today. Consumption of polyunsaturated fat in the U.S. has gone from about 13 grams per day to nearly 40 grams per day over the past century (see figure below). By far, the type of omega fats that most Westerners get too much of is the omega-6 variety, due to its prevalence in processed foods—and this is what's driving up the line on the graph. It is easy to get confused when reading about the different types of fats—there are saturated fats and unsaturated fats, omega-3s and omega-6s, PUFAs, long-chain and short-chain fats, and the list goes on. In order to help clear up the confusion, this article aims to provide you with a "primer" on fatty acids to increase your understanding of the fundamental differences between the types of fats and how your body uses them. So let's start by taking a look at the overall category called "fats"—what they're made of and what they do for you. And then we'll take a closer look at PUFAs and omega-3s. Fats are one member of a group of water-insoluble substances called "lipids." Lipids are important to you because they are the primary components of your cell membranes. Other members of the lipid group include sterols, phospholipids, triglycerides, and waxes. The properties of fats and fatty acids depend on their degree of hydrogen saturation and the length of their molecules, or "chain length." Chemically, a fatty acid is a chain of carbon atoms with pairs of hydrogen atoms attached, with an "acid group" attached to one end of the molecule. Vegetable oils and animal fats are typically composed of a mixture of these different fatty acid types. For example, olive oil is mostly monounsaturated fat with a small amount of polyunsaturated fat. Lard is primarily equal parts saturated fat and monounsaturated fat, but contains some polyunsaturated fat as well. Most vegetable oils high in PUFA, whereas most animal fats are high in saturated and monounsaturated fats (except for palm, coconut, and olive oils). Saturated and monounsaturated fats are more easily used by your body than polyunsaturated fats. A fatty acid's chain length and saturation control its melting point. As chain length increases, melting point increases. Likewise, fats that are solid at room temperature (butter, coconut oil) have longer chain lengths than fats that are liquid at room temperature (fish oil, olive oil). With chain lengths being equal, unsaturated fats have lower melting points than saturated fats. Because your tissues are made up mostly of saturated and monounsaturated fats, your body requires more of them than polyunsaturated fats (which is true of all mammals). The main dietary PUFAs are omega-3 and omega-6 fats. Although your body does need these, it needs them in relatively small quantities. One of the problems with PUFAs is that they are very chemically unstable, and highly susceptible to being altered and denatured by what's around them. Think about what happens to the oils in your pantry—they are susceptible to going rancid as a result of oxidation. In your body, PUFAs undergo a similar process when exposed to the toxic byproducts of proteins and sugars—especially fructose. This is why most fish oil supplements have such a short shelf life, and many are already oxidized before they hit the bottle. Consuming oxidized fats can do your body more harm than good. When you eat too many PUFAs, they are increasingly incorporated into your cell membranes. Because these fats are unstable, your cells become fragile and prone to oxidation, which leads to all sorts of health problems, such as atherosclerosis. Now let's take a look at the most common PUFAs in your diet—the omega fats. The end of the fatty acid chain, opposite the acid end, is the "omega end." The location of the first double bond from the omega end dictates whether a fatty acid is an omega-3, omega-6, omega-9 (oleic acid), or another member of the "omega family." Both omega-3s and omega-6s come in both short-and long-chain varieties. Plant Based: The shorter-chain form of omega-3 is alpha-linolenic acid (ALA), the only omega-3 found in plants (except for some algae). Foods rich in ALA include flaxseed oil (53 percent), canola oil (11 percent), English walnuts (9 percent), and soybean oil (7 percent). ALA is considered essential because your body can't make it, so you need it in your diet—or its long-chain derivatives. Animal Based: The longer-chain forms of omega-3 are found mostly in animals and they are eicosapentaenoic and docosahexaenoic acids (EPA and DHA) and are highly unsaturated, mainly found in fish, shellfish and krill. DHA is the primary structural component of your brain and retina, and EPA is its precursor. Your body can make some EPA and DHA from short-chain ALA, but does so inefficiently. Recent studies suggest less than one percent of ALA is converted, if you are consuming the typical Western diet. DHA is found in cod liver oil, fatty fish, and in smaller concentrations in the organs and fats of land animals. Shorter-chain: The shorter-chain form of omega-6 is linoleic acid (LA), which is the most prevalent PUFA in the Western diet, is abundant in corn oil, sunflower oil, soybean oil and canola oil. Longer-chain: The longer-chain form of omega-6 is arachidonic acid (AA), which is an important constituent of cell membranes and a material your body uses to make substances that combat infection, regulate inflammation, promote blood clotting, and allow your cells to communicate. AA is found in liver, egg yolks, animal meats and seafood. "Essential fatty acids" (EFAs) is a term referring to the PUFAs your body needs but cannot produce (or convert from other fats), so they must be obtained from your diet. Traditionally, only two fats were considered "essential"—ALA (an omega-3 fat) and LA (an omega-6 fat). However, we now know it's the long-chain derivatives—arachidonic acid, DHA, and EPA—that your body needs the most. Although you have the enzymes to convert LA into these longer-chain fats (ALA, DHA and EPA), the conversion isn't efficient enough for optimal brain growth and development. This has led to a recent rethinking of what fats to consider "essential" and recommendations for adding more long-chain fats to your diet, to better meet these biological demands. DHA and EPA: The "Anti-Inflammatory Fats"
In fact, if you go to the omega-3 fat page on GreenMedInfo.com, you will see a list of scientific studies supporting the benefits of omega-3s for 254 different diseases, which is powerful proof of their broad-reaching scope. One reason omega-3s are so good for you is their anti-inflammatory properties, especially the omega-3s from animal sources. In the case of DHA, your tissues use this fatty acid it to synthesize compounds called "resolvins," which help to reduce inflammation. "Sufficient DHA allows the immune system to mount a robust inflammatory response against invading pathogens or damaged tissues and to bring the response quickly to an end once the task has been accomplished. Researchers are increasingly discovering that most degenerative diseases involve an element of chronic, low-level inflammation, and the inability to "turn off" important inflammatory processes once they are no longer needed could be part of the problem. DHA deficiency may therefore be at the root of widespread declines in cognitive function, increases in mental disorders and epidemic levels of degenerative disease." A study in the journal Pediatrics even showed that supplementing a mother's DHA during pregnancy and lactation improves her child's IQ at four years of age. EPA, which accumulates in fish, is a precursor to DHA. Just like DHA, EPA also helps to control inflammation, but this time by interfering with arachidonic acid metabolism. Arachidonic acid is the precursor to PGE2 (a prostaglandin), which is a major initiator of inflammation. You can see how DHA and EPA would work together to naturally reduce inflammation and improve inflammatory conditions like rheumatoid arthritis and asthma. EPA/DHA supplementation has helped people with ulcerative colitis. Several studies have shown that people with schizophrenia often have low levels of the particular EFAs necessary for normal nerve cell membrane metabolism. Early results from a few trials suggest EPA can have a positive effect on the mental status of schizophrenics. Epidemiological evidence suggests that populations consuming marine diets rich in EPA have a low incidence of cancer. Experimental studies, both in vitro and in vivo, further support EPA's anti-cancer activity. Even though the medical establishment for decades has advised you to consume vegetable oils (omega-6 PUFAs) to prevent heart disease, human trials have conclusively demonstrated that vegetable oils DO NOT decrease atherosclerosis or decrease your risk of dying from cardiovascular disease. But the news gets even worse. Studies have revealed that vegetable oils actually increase your risk of cancer after a period of about five years, and may increase your risk of heart disease as well. There is a widespread medical myth that atherosclerotic plaque is caused by too much LDL and cholesterol in your blood. Yet, this is not what the research shows! Instead, science tells us that the mechanism driving atherosclerosis is actually the oxidation of PUFAs in your LDL membrane. You may recall that excess PUFAs lead to fragile cell membranes that can easily be damaged by oxidation. Furthermore, high LDL appears to be a sign of cholesterol sulfate deficiency—it's your body's way of trying to maintain the correct balance by taking damaged LDL and turning it into plaque, within which the blood platelets produce the cholesterol sulfate your heart and brain needs for optimal function. What this also means is that when you artificially lower your cholesterol with a statin drug, which effectively reduces that plaque but doesn't address the root problem, your body is not able to compensate any longer, and as a result of lack of cholesterol sulfate you may end up with heart failure. For more details on this, please review my interview with Dr. Stephanie Seneff. Marine oils are an excellent source of EPA-and DHA-rich omega-3 fats. Many cultures around the world that subsist on traditional diets have very low to nonexistent cardiovascular disease. Many of these cultures have a high intake of marine oils (e.g., the Inuit)—but some do not. But, what ALL of these groups do have in common is the near absence of refined foods. If you are eating standard American fare, simply taking an omega-3 supplement may not be enough because it needs to be implemented as part of a TOTAL nutrition plan, which should include eliminating refined/processed food and excess sugar and grains, and a return to whole foods, with an emphasis on fresh organic vegetables and meats. Basically, it's a return to what our ancestors ate. So, how do you know if you're getting enough omega-3 fats? There are many who argue you can get all of the omega-3 fats you need from plant sources, but I disagree. Plant-based omega-3 sources include flax, hemp, and chia seeds, which are all high in ALA. Your body can convert ALA into EPA and DHA—but only in small quantities, as I discussed earlier. While you certainly should consume these plant-based fats, you cannot rely on them exclusively to meet all your body's omega-3 fat requirements. Your body needs all three omega-3 fats (ALA, EPA and DHA), and for this, you need both plant AND animal sources. You should avoid taking DHA-only products, for the same reason. For optimal health, then, it boils down to the need for balance among these various essential fats, and you can achieve this balance by eating a diet that incorporates a wide variety of whole foods from both plant and animal sources, and a good omega-3 supplement. In a perfect world, you'd get all of the animal-based omega-3s you needed from eating fish and seafood. But the sad reality is that industrial pollution has contaminated most of the world's fish and seafood with a variety of dangerous toxins like mercury and PCBs. The one exception is krill oil, my favorite omega-3 fat supplement. Krill does not generally have this contamination. Highest Bioavailability: The omega-3 in krill oil is bound in a phospholipid structure, making it far more bioavailable than fish oil. In fact, nearly 100 percent of the DHA and EPA in krill oil are immediately available to your body. The omega-3 fats in fish oil, on the other hand, are in triglyceride molecules that have to be broken down in your gut into their base fats, EPA and DHA. Once these fats are absorbed into your bloodstream, your liver then has to attach them to phoshphatidyl choline molecules in order for them be used by your tissues. Highest Stability: Unlike ordinary fish oil, krill oil naturally contains the powerful antioxidant astaxanthin, which prevents the perishable DHA and EPA from oxidizing and going rancid. Highest Sustainability: Krill is the largest biomass in the world, and krill harvesting is one of the best regulated on the planet, with strict catch regulations that are reviewed regularly to ensure sustainability. Lowest Dose: Krill oil works at a much lower dose than fish oil. Because krill oil is so potent and used so efficiently by your body, you may only need one 500 mg capsule per day. Absorption of positively-charged minerals, especially iron, zinc, and magnesium, is blocked by the phytates of grains. It means that every time you include a grain in your meal–as advised by our own USDA and other health agencies–you effectively turn off absorption of essential minerals. Obviously, with frequent grain consumption, nutritional deficiencies develop. You could try and remedy this situation by consuming grains while supplementing minerals, hoping to overcome the effect, but this usually does’nt work to fully compensate for blocked absorption, while also exposing you to all the other destructive effects of wheat and grains. This is how it is done, of course, in conventional circles, or deficiencies are simply overlooked or ignored. The phytate content of a bagel or two slices of whole wheat bread is enough to block iron absorption by 90%. Iron deficiency results in fatigue, lightheadedness, feelings of being cold, and poor physical performance. The second most common worldwide cause for iron deficiency anemia is grain consumption, second only to blood loss (e.g., menstrual cycles). (The World Health Organization knows all about this phenomenon, as they must contend with iron deficiency that develops when grains are shipped in to relieve hunger in Third World regions.) Wheat and grains are very common causes for “unexplained” iron deficiency anemia that fails to fully respond to iron supplementation, rebounding back to normal with grain elimination. Zinc deficiency can manifest in myriad ways, but most commonly results in skin rashes (often misdiagnosed as seborrhea, eczema, or other rashes), itchiness, a white coating on the tongue, impaired growth and impaired learning in children, reduced sense of taste and smell, and gastrointestinal distress. Magnesium deficiency shows as muscle cramps in the fingers or “charlie horses” in the calves, higher blood pressure and blood sugar, loss of bone density, and heart rhythm disorders. Iron is best managed by checking a blood level of ferritin (reflecting stored iron) and a complete blood count (CBC) to diagnose anemia. While grain elimination may often be sufficient to allow increased iron absorption, iron supplementation may need to be undertaken if iron deficiency anemia is identified. Iron supplementation should not be undertaken blindly without monitoring ferritin and the hemoglobin value on the CBC, as iron overload can also occur. Magnesium can be safely supplemented by the majority of people. (People with impaired kidney function can accumulate magnesium and should only supplement if levels are monitored.) I recommend taking the magnesium malate form, 1200 mg twice per day (180 mg “elemental” magnesium twice per day). This helps reverse muscle cramps, reduce blood pressure and modestly reduce blood sugar, increase bone density, and quiet abnormal heart rhythms. Including plentiful pumpkin, sunflower, and sesame seeds, as well as green leafy vegetables, further augments magnesium intake. In my experience, given the consumption of filtered water and the low magnesium content of modern produce, it is best to supplement magnesium for a lifetime. Zinc can also be safely supplemented, 10-15 mg once per day, without monitoring levels. As gastrointestinal absorption improves and you include zinc-rich animal products, long term supplementation is probably not necessary. Note that we are talking about how to reverse adverse health effects of wheat and grain consumption, i.e., how to undo the harmful effects of awful advice to eat plenty of “healthy whole grains,” the most disastrous dietary advice ever offered, particularly when coupled with “cut your fat, cut your saturated fat” fictions. Modern dietary advice is not only ineffective, but harmful. But once you understand this fundamental issue, health on a scale you previously thought you’d never achieve becomes possible. More about these issues can be found in Wheat Belly Total Health. 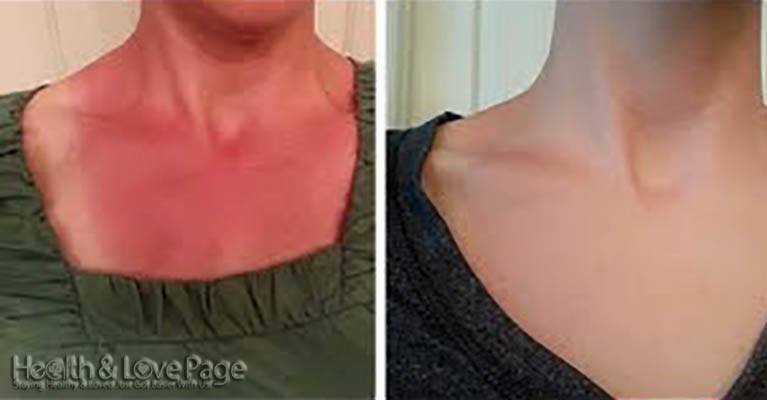 She’s Got A Terrible Sunburn, But It Disappears After She Applies Just 2 Simple Ingredients. Wow! Summer is around the corner. For many people this means that it is time for the exciting summer vacation and visiting local beaches in the place where they are staying. They are preparing their swimsuits, towels and other items used on the beach too. Many of them are wondering what they should bring and what can be left at home and if you are one of them you should know that the sunscreen should be on top of the list of important items. There is no doubt that sunburns are annoying and painful, but what is even worse is that they can affect our health in the long run too. In case you are exposed to sun for a long period of time then you will definitely get sunburn. However, if you get the right treatment, the negative effects of sunburn will be minimized. The main problem is that the vast majority of people don’t know what exactly they should in case of sunburns. The good news is that there is an easy and simple do-it-yourself sunburn remedy that consists of two ingredients. All you need is a simple spray bottle and lavender oil, peppermint oil and water. Mix these natural ingredients and use the spray bottle to spray the solution directly on the problematic areas. You will be able to ease the pain and accelerate the healing process thanks to these two essential oils. It was proven that they provide even better results than Aloe Vera gels and commercial sunburn kits. In order to experience the best effects, use this remedy in the first 24 hours after you notice the sunburns. As a matter of fact, the faster you use the spray bottle, the better results it will produce on the skin. I have a family history of glaucoma and I was wondering if there's anything I can do to help avoid problems down the line. I'm a healthy, active woman in my 50s. Any input concerning glaucoma prevention would be appreciated. Glaucoma (or ocular hypertension) is a condition marked by an increase in inner eye pressures and subsequent damage to the optic nerve. After cataracts, glaucoma is the second leading cause of blindness in the world. It’s been diagnosed in nearly 2.3 million Americans and the signs and symptoms of glaucoma likely affect at least 2 million more—most of them over the age of 60. A first-degree relative with glaucoma does increase risk, so it’s a good idea to do what you can for glaucoma prevention. Lifestyle measures, such as a healthy diet, regular exercise, and smoking cessation,are protective, as is supplemental vitamin C (at least 2,000–3,000 mg daily),which helps lower intraocular pressures. However, my number 1 recommendation is an herbal supplement called Mirtogenol. Studies suggest that this blend of bilberry and pycnogenol normalizes pressures within the eye and reduces the risk of developing glaucoma. In one study, 20 people with slightly elevated intraocular pressures took 240 mg of Mirtogenol daily. After three months, 19 of them had significant decreases in eye pressures, while only one of 18 in a control group experienced improvements. At the end of the six-month study, the Mirtogenol group also had marked improvements in blood flow in the ocular arteries. Another clinical trial tested six months of daily use of 120 mg of Mirtogenol, the prescription eye drop Latanoprost or a combination of the two in patients with average intraocular pressures of 38.1 mmHg (normal is less than 21). Although the combination of the prescription eye drops and Mirtogenol was most effective in glaucoma prevention, lowering eye pressures to 23 mmHg, Mirtogenol alone performed extremely well, decreasing pressures by nine points and increasing ocular blood flow in a manner similar to that of the drops.